Though I have many, many different art influences, I would have to say that the artists who've had the most significant influence on my work are the early 20th century American realists. 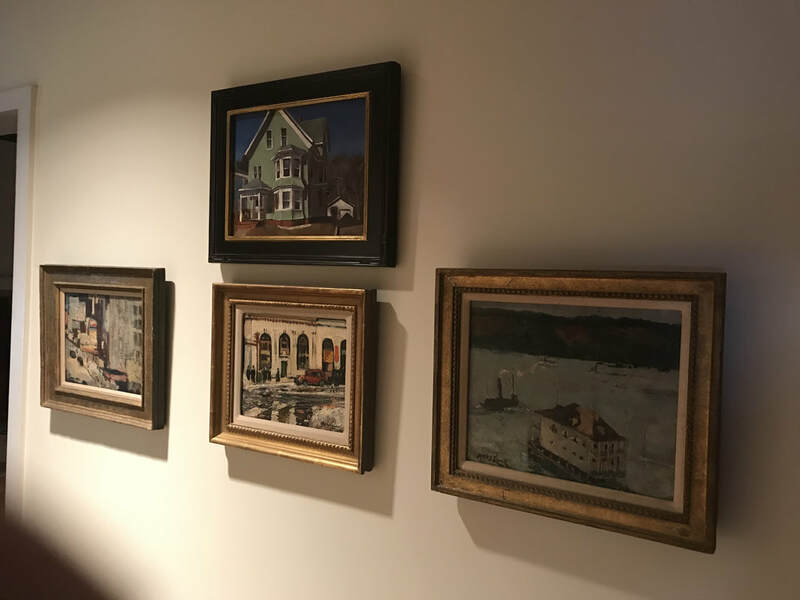 Artists like Robert Henri, John Sloan, George Luks, George Bellows, Edward Hopper, and so many more have had a profound effect on my painting style. I have a good sized library of art books to which I am constantly adding and from which I am forever referencing. As a largely self- taught artist, I have essentially taught myself to paint by constantly studying these past American greats. Among this group is an Australian- American painter named Hayley Lever. I presently own two publications on Lever which are filled with vibrant, color reproductions of his unique style. Lever arrived in New York City in 1912 and painted views of the Hudson River, Times Square and Central Park. Upon discovering the American east coast, he painted in Gloucester, MA for several summers and at Marblehead, MA. He developed a spontaneous, bold painting style, and he was accepted into a circle of those aforementioned emerging greats including : Robert Henri, William Glackens, John Sloan and George Bellows. He exhibited with this group regularly, but eventually left New York to settle in Massachusetts. From 1919 to 1931, Lever taught art classes at the Art Students League of New York where he maintained a Gloucester studio and often traveled to paint on Nantucket and Martha's Vineyard. He offered this message to his students: "Art is the re-creation of mood in line, form and color. If I were confined to my own back yard for the rest of my life, I'd still have more pictures in my mind than I would have time to paint. Art is nothing but having a good time." Lever was inflicted with arthritis in his right hand in later life, which prevented him from further travel and forced him to concentrate on still-life subjects instead. As his arthritis advanced, he taught himself to paint with his left hand. However, following the death of his wife Aida in 1949, Lever was confined to his home, where he continued to paint from 1953 until his death in 1958. So fast forward to 2018, when a 45 year old artist and disabled veteran (me) suddenly gets some attention on the national news and a NYC art collector sees the coverage, decides to search the artist out online and purchase a painting from him. The collector hangs the piece in his hallway amidst a triad of Hayley Lever NYC scenes (a subject matter of his highly sought after). I can't begin to tell you how much this means to me. On some level, it is akin to having one of my paintings hanging in a museum. It validates the last 15 years of my life. To have one of my own paintings hanging in a space among such an icon of modernism has literally left me speechless and I am forever grateful to all those collectors out there who have invested their hard-earned income in my work. It is the artist's goal to make a connection with the viewer and when it genuinely happens, there is nothing more gratifying. Welcome to my new website! In the weeks and months to come, I'll be posting any new original paintings, prints, and news events here. Click the 'ARTWORK' tab to see what's available now. I'm offering free shipping for the rest of July. Allow two weeks processing and delivery on giclee print orders.